I was really touched to receive this in my inbox last week so I thought I would share it here. A client of mine who I worked with last Summer has put tougether a very thoughtful and considered analysis of the mural I completed for his sons nursery. Tragically his son's birth coincided with the death of the families cat, Marisol, for whom the mural is named. He was a lovely cat, I was so saddened to hear about his accident and as Dr.Pushkar notes in his essay it seems quite eerie that the two events coincided with each other. Purely by chance the name of the mural is also a play on the Elysian Fields, the final resting place of the heroic and virtuous in classical Greek mythology. Very odd. I think this essay really understands my artistic approach and influences, all my rambling about hauntology and Fredric Jameson translated into a coherent, cathartic statement. Thank you for sharing this with me Piyush. In August of this year, artist Matthew Frame created a mural in our nursery. It was named after our cat, Marisol, a slight, grey moggy who was often mistaken for a British shorthair. It is her that sits in the bottom left corner of the wall, staring straight at the viewer. Other animals and flora float above her and to the right, seeming to inhabit her dreaming consciousness. Frame chose what to depict by speaking to me and my wife about our memories and places of relevance to us. In the centre of the wall, a Manchester bee hovers above a rose from our Manchester garden. Perching on a branch above the bee is a hornbill from Bihar, where my parents grew up. Other creatures abound, creatures not normally seen together: a tiger, a ladybird, an otter. 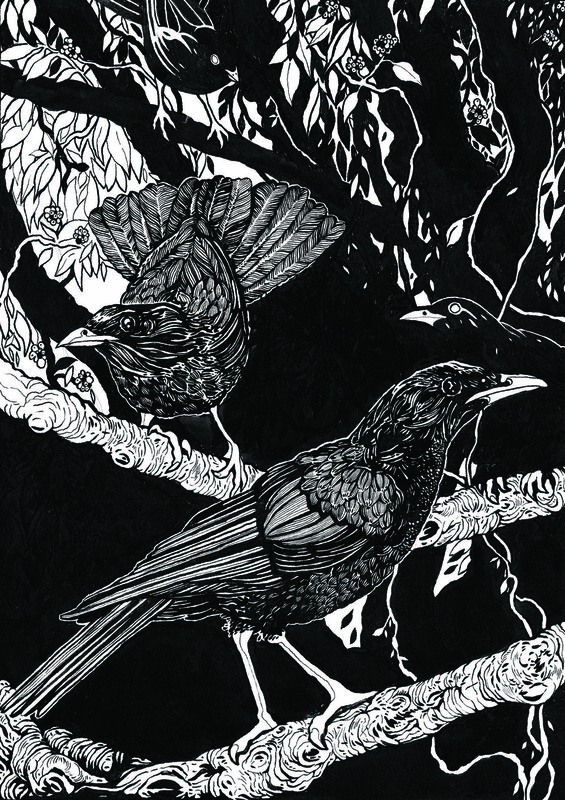 Interwoven in monochrome foliage, these animals appear all at once, with no perspectival depth. All of our memories, and all of our presents, together, now. On 1 September our son, Frederick, for whom the mural had been drawn, was born. On 2 September, Marisol died. She was run over by a passing car on a nearby street. Our friends came to meet Freddie and congratulate us. They commented on the coincidence of these events, the death of our cat and the birth of our son. It was ‘weird’. One might find it mawkish to mourn the death of a cat. But at this time of emotional undulations, I hope the reader will find it unsurprising that we were sad that our cat had died. Along with our delight with each and every move our son made, our emotions were mixed with something else. Something more unsettling that the word, ‘weird’ can only begin to suggest. There was a vague sense that Marisol’s death was somehow strangely appropriate. The word that came to mind was ‘uncanny’. This word captures something of what is strange within the familiar. For Freud, the uncanny relates to the repetition of repressed memories in your current consciousness. Emotionally, you recognise the outlines of something previously concealed, held back. You feel the dread of something terrible. But you can’t change it. You are left helpless in the face of this thing that you have not fully got your head round. It is the intimate connection between something hidden and something revealed that pushes Marisolysian Fields further into the uncanny. All of Frame’s work relies on an incredibly precise, intricate draughtsmanship: the individual barbs on the feathers of an ibis, the sinews on the face of a frog, the fur sitting in the folds of muscle and fat around Marisol’s haunches. This level of detail takes your attention away from the lack of perspective. Everything is depicted on one plane, effacing any sense of movement, time or, indeed, progress. Frame is fascinated by Fukuyama’s famous statement that the Berlin wall coming down marked the end of history, the end of progress. Since then we have had globalisation, economic crashes, waves of populism, terrorist attacks accompanied by a ‘war on terror’, and Nickelback. But have we had any new ideas for how to advance humanity, or are we stuck with (neo)liberal capitalism? Successive leaders have promised change: Blair, Cameron, and, yes, Corbyn. But have they delivered, or will they deliver it? Have we lost the sense of a path forwards, of a political imaginary that can genuinely transform and improve the lives of the global population? If so, what might this mean for art? Capitalism demands growth. Entrepreneurs, startups, businesses search for the new, the next big thing, the next gap to fill. But in the absence of a political imaginary of the future, our search for the new leads us backwards, to relics, remnants and repetitions: Star Wars sequels, Downton Abbey, Bruno Mars, Harry Potter, the English National Opera, Stuckism. My recognition of this conservatism makes me no less a part of it. The gnawing horror of Strictly’s banality will not stop me from sitting down to enjoy its glitter and bawdy sparkle tonight. I can suppress the admonitory reaction of my superego for just long enough to appreciate Tess and Claudia’s nods and winks to ‘a simpler time’. Frederic Jameson called this tendency to look backwards rather than forwards ‘postmodernism’, a word that has risen and fallen since he used it in 1992. In his view, this repetition of past motifs and themes had no political import, mimicry was ‘amputated of the satiric impulse’. Pastiche replaces parody, and art becomes not a progressive force, but a ‘statue with blind eyeballs’. So what is Marisolysian Fields: pastiche or parody? The single plane exposes the timelessness, the political torpor of our time, and forces it all on you at once. The absence of movement and perspective encourages you to move, first drawn inwards to inspect the finer details inside the thickly wrought outlines of the otter, the ladybird, the mangoes. You see the strokes of Frame’s marker pens, and then feel yourself pushed backwards as far as possible to grapple with it all. The concentrated complexity can be overwhelming. Frame negates the ‘helplessness’ of the uncanny by engaging the viewer in action, but where that action takes you is not his responsibility. As the viewer, it is mine. I am no longer helpless, but nor am I reassured. And what of the dead cat that now haunts our nursery? Frame could not have predicted that Marisol would die. But he did suggest time and progress in other ways. He drew a largely monochrome mural, with injections of block colour, for a little boy who can not yet see anything other than black and white. As Freddie grows, he will begin to see the orangeness of the tiger, the redness of the ladybird, the yellowness of the mangoes. And just like I have never seen hornbills in Bihar, Freddie never saw Marisol. Frame throws them all together, strange, familiar and strangely familiar. He unapologetically forces the viewer to make sense of it. Freddie will have a lifetime to do so. Dr. Piyush Pushkar is an NHS psychiatry doctor, Wellcome Trust fellow, and co-chair of Manchester Medact. He is currently conducting research for a PhD at the University of Manchester. In preparation for an upcoming talk I’ve pulled to together an overview of the design process behind my two latest projects, from conception to final publication. It’s been quite interesting for me trawling back through the various iterations, plans and email exchanges that shaped these books, and I hope this little insight into my working practices will make for a similarly interesting read. 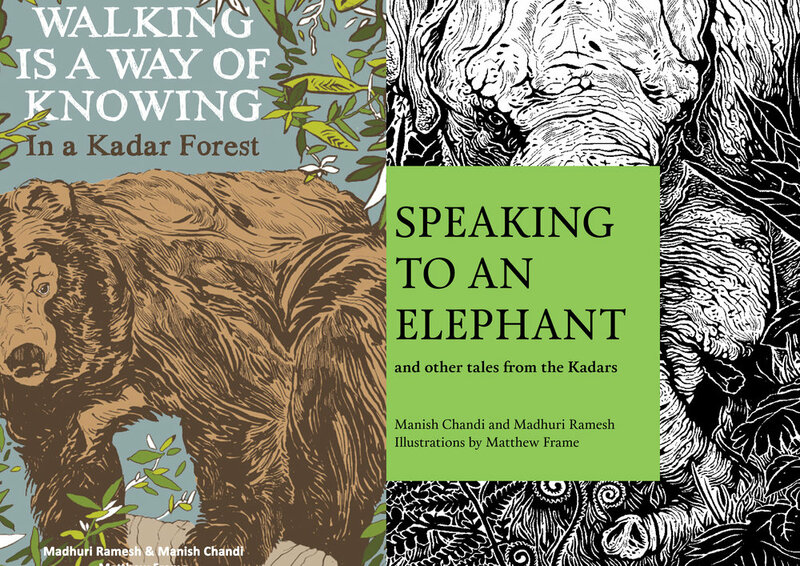 I was initially approached by Tara Books in 2015 to work on Walking is a Way of Knowing; an account of a walk in the forest with a collection of Kadar elders, a tribal community that inhabit the Anamalais Foothills of the Western Ghats, South India. The original plan for the book was for it to be photography based, unfortunately the photographer Tara was initially working with ran into some problems. The problem was that the permissions from the forest department were hard to get - and for two reasons. They are generally difficult folks to deal with; but also that year had been declared a drought year that meant that visits to the forest were curtailed. Since we could not progress much on this path, we considered working with illustrators who would respond to the text, and get its essence. 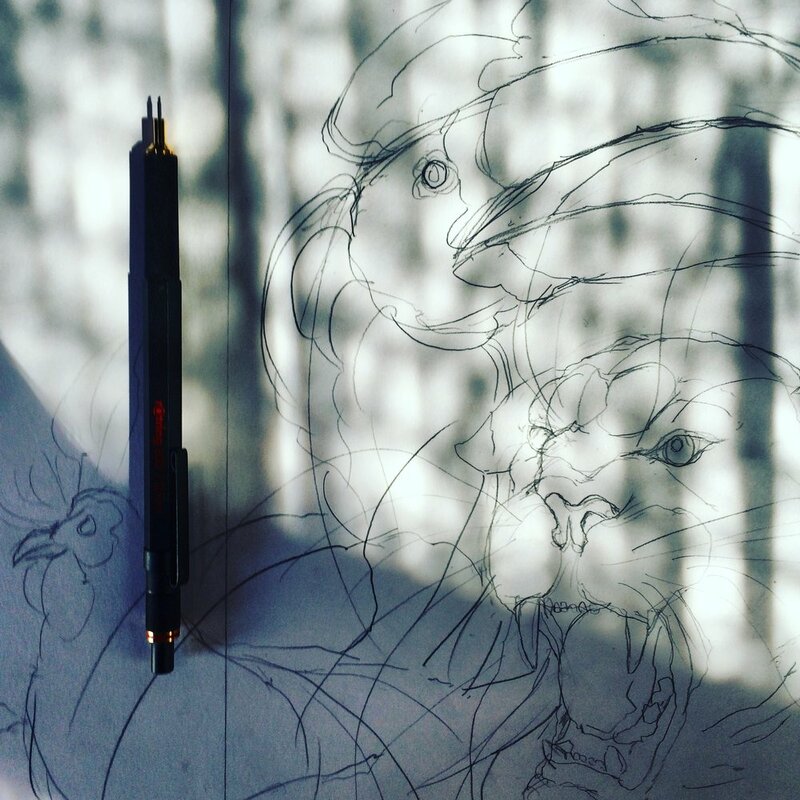 We tried out two illustrators - one a well-known French illustrator who's done some lovely drawings of beasts and birds. But while she could convey the character of creatures, her art was far too abstract, and did not really go with the text, which is actually full of details. 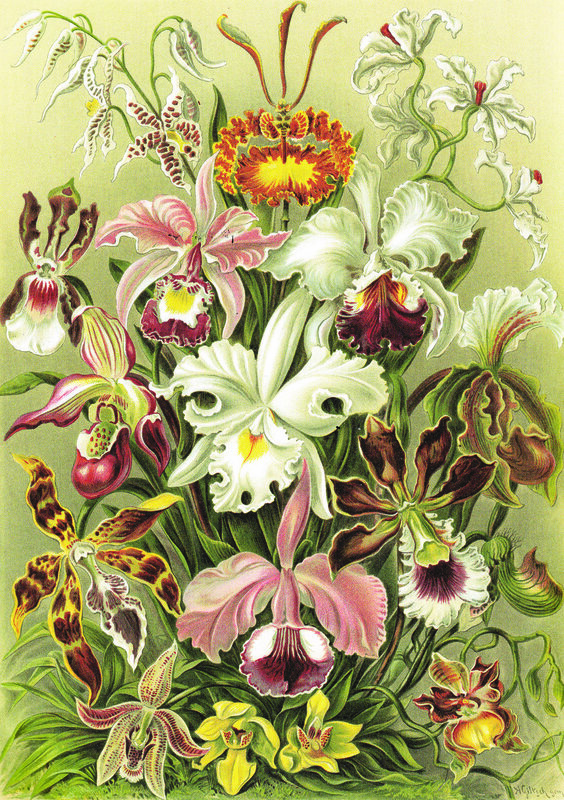 We then tried to work with another artist who had done nature drawings, but that did not come through either. I had previously worked for Tara on The Boy Who Speaks in Numbers, a story about the civil war in Sri Lanka as told through the eyes of an autistic Tamil refugee. The plant and animal illustration running through the book and my research based approach to briefs being key components for these new publications. The book was to be aimed at children ages 12 and above and was neither a how-to book, nor a mere information book but rather a means to open the readers mind to ways of seeing and learning from unexpected contexts and teachers. In this case, the forest itself and the indigenous people who make it their home. In essence the book was to be a sensuous exploration of a particular environment, about 'knowing' nature differently, evoking the sounds, smells, sights and feelings of the forest. The book was also to be pedagogic in value, a parent or educator being able to draw out hidden depths from the text whilst simultaneously being enjoyable for a child to read on their own. The central challenge as laid out by the publishers was to depict a naturalistic representation of the world the Kadar’s inhabit whilst also creating a metaphoric sense of it that would work effectively in the context of a picture book. 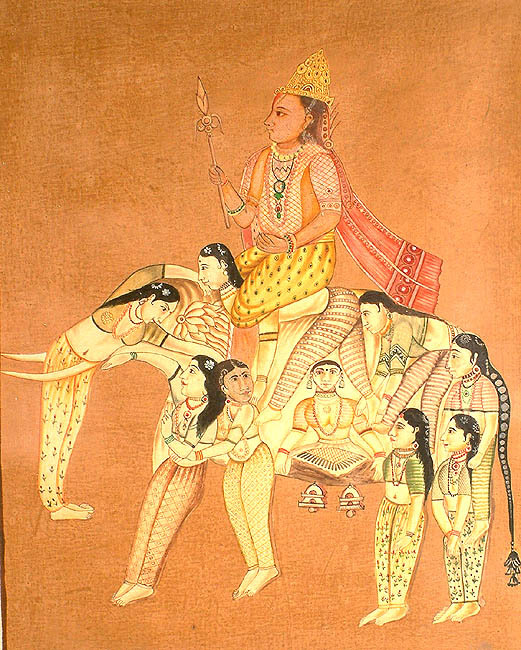 Subsequently Tara reached out with the manuscript for its companion volume, Speaking to an Elephant, a re-telling of the tribe’s religious and folk stories. The focus of this publication was to be less of an educational nature, with the scenes and contexts visualized in a more story-driven fashion for younger readers. The 5 tales in the book explore how the tribe became friends with the elephants, why the tortoise has such a distinctive shell and why grasshoppers hop as they do. They also center on the Kadar’s primary deity, Kadavul the Creator, who embodies a set of generative qualities that allow the flowers to bloom and the forest to live. The sense I gained upon my reading of WIAWOK was the connectivity the Kadar have to their surroundings, through their presence and interaction with the animals and foliage they have become both the consciousness of the forest and the keepers of its secrets. I began to research various different approaches to the brief, namely artists and designers who had developed ways of creating beautiful imagery as a means to educate their viewers. 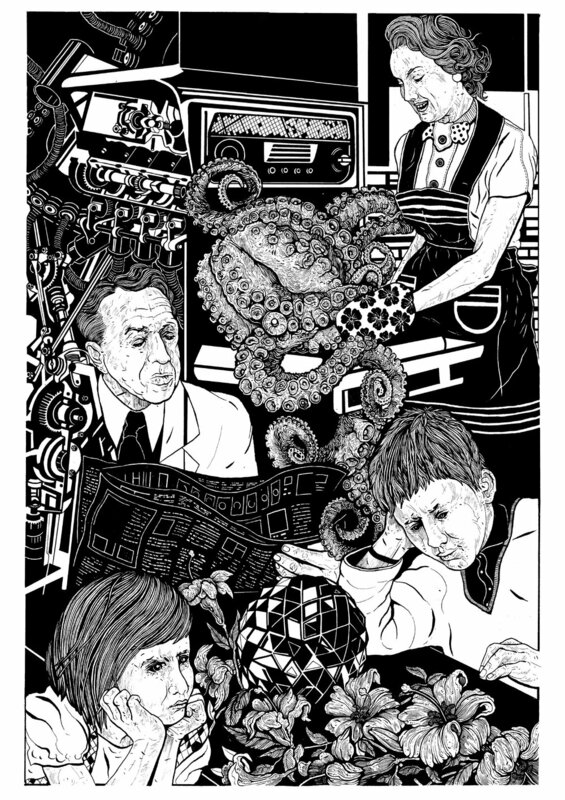 Using the works of Ernst Haeckel (1834 – 1919) and Fritz Kahn (1888 – 1968) as a starting point my intention was to draw on their visual techniques to illustrate the switch from describing the metaphysical nature of life in the forest to the practicalities of the Kadar’s day-to-day existence. 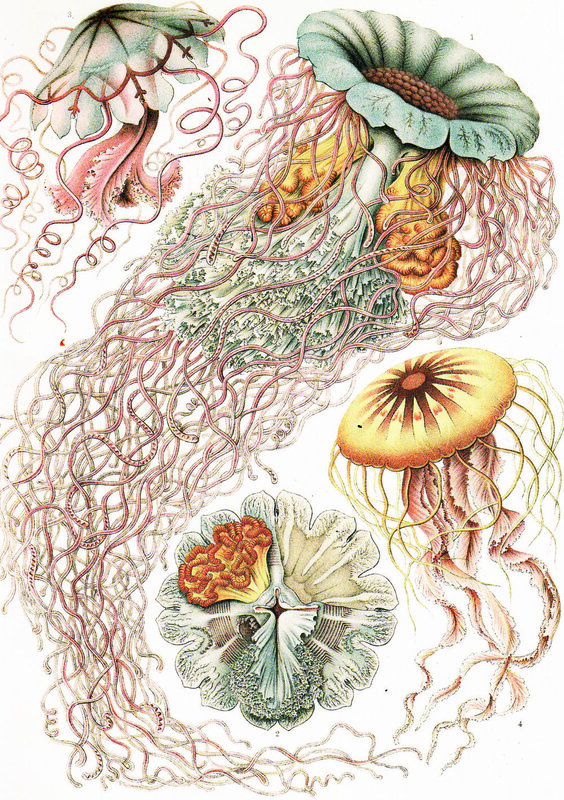 The biologist, philosopher and artist, Ernst Haeckel’s contribution to the world of evolutionary theory through his collection of beautiful lithographs, Art Forms in Nature (p.1904) cannot be understated. 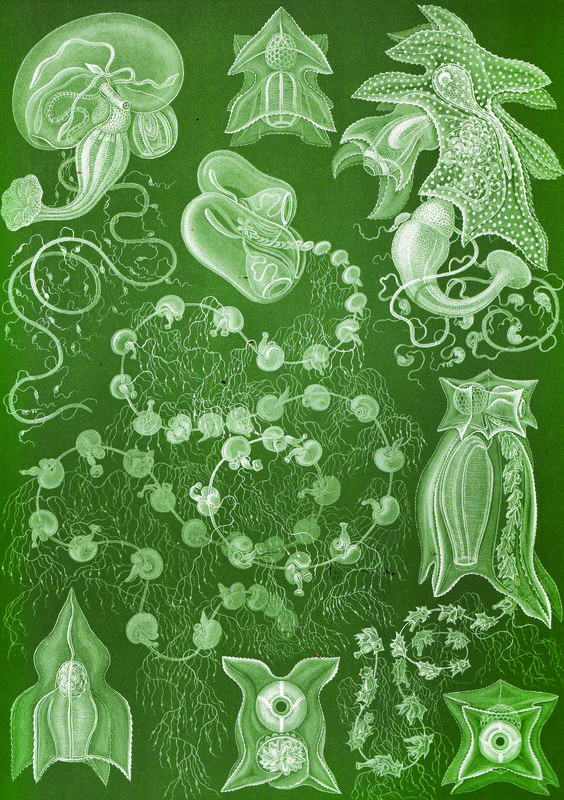 Through a mixture of scientific observation and artistic composition Haeckel described the beauty of nature and it’s interconnectedness, the strange forms finding expression in his work depicting the principle unity of all living things. He made nature seem approachable by focusing on organic symmetries, the diversity of species simplified into harmonious, art nouveau motifs. 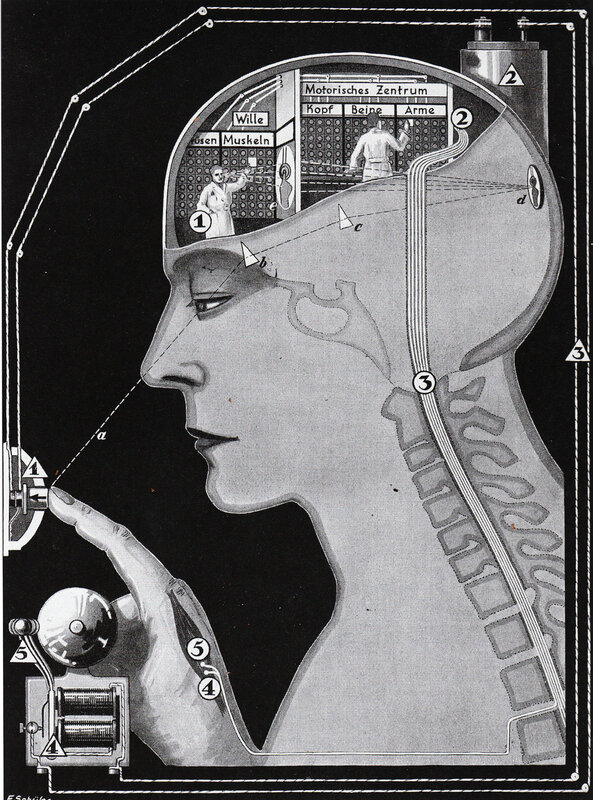 Fritz Kahn was a practicing physician who popularized the use of analogous illustrations to convey complex scientific information. 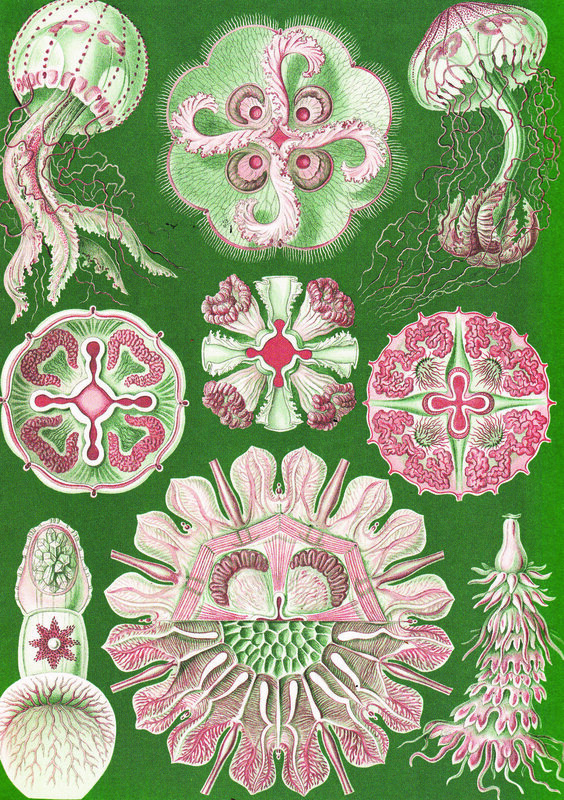 He collaborated with an array of illustrators who employed a number of visual tricks to ground his scientific pamphlets in popular comprehension. I love Kahn’s use of verbal and pictorial metaphors as a means of educating a large audience, specifically his adaptation of the newly industrialized workspace as a means to explain vision, hearing and taste. My aim was to invert this concept, using the landscape as a means to express the sensations of the forest to city dwellers, creating a series of surreal tableaus in which human forms intertwine with nature. The naturalist paintings created by the atelier of the Mughal courts in the late 16th and 17th century also provided a source of inspiration. 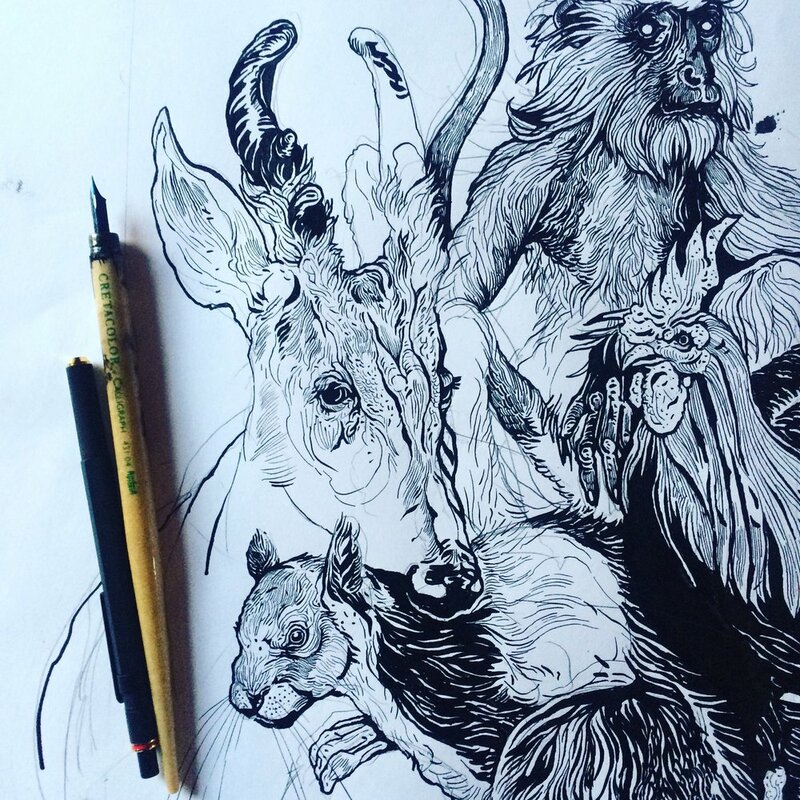 The flat, multi-layered style of illustration used in the depiction of animals and plant life, the accuracy achieved by bold outlines and minute observations of characteristic, physical features within the animal kingdom being something I have emulated within my work. I wanted to emphasize the significance placed upon ancestral spirits inhabiting the forest within the book. 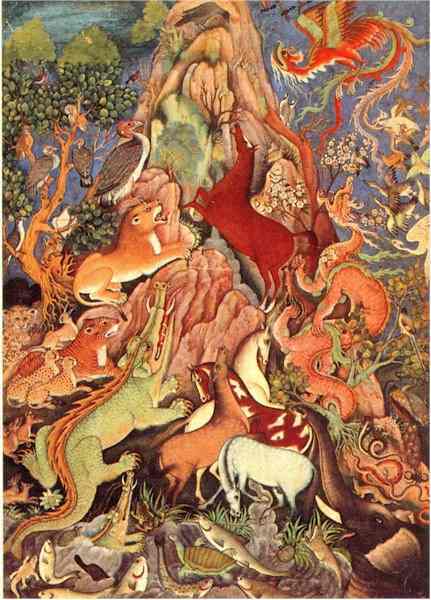 The composite animal depictions in Mughal art; intertwined animal, human and demon forms a becoming a visual shorthand, demonstrating the spiritual interconnectivity of the Kadar with their environment and cultural heritage. The initial draft of the text was subsequently built upon to convey a less abstract narrative that developed the social bonds between the elders and defined the protagonist as an individual in their own right. This tonal shift led to a readdressing of my approach, focusing more on the Kadar’s interaction with each other and the interconnected stories they wove about the forest. I was a little surprised that the text I had been working from was not the final version and that the planning I had put into the project thus far would need to be folded into a significantly different narrative. Speaking to Tara they explained that the authors were responding to my illustrations, they loved the shape the book was taking and had been working on the original copy during another expedition to the forests. Ultimately it has resulted in a better book and it was also a great learning experience, the publication relying on multiple different creative processes that can be alter and shift in many ways - being able to respond to these changes is part of what makes illustration such a challenging and interesting job. Research was key to this brief, the style of writing demanding an interplay between image and text that could only be achieved through close collaboration with the publisher and authors. 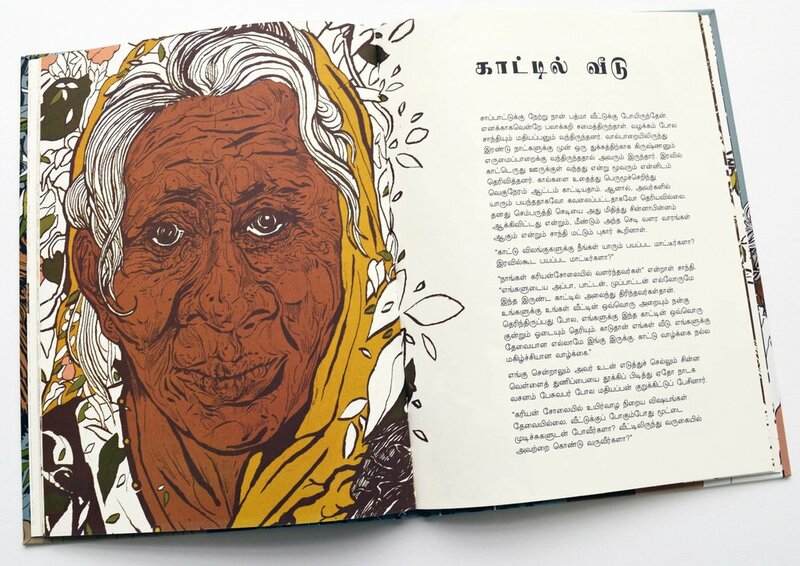 For example, the picture above of the Kadar elders gathered at a bus stop was one of the first I completed for the book, and whilst being well received I was informed that South Indian women wear their saris over the left shoulder as opposed to the right as I had depicted them. A simple Photoshop flip solved the issue but it really highlighted for me the care I would have to take in depicting this tribe who live half the world away. 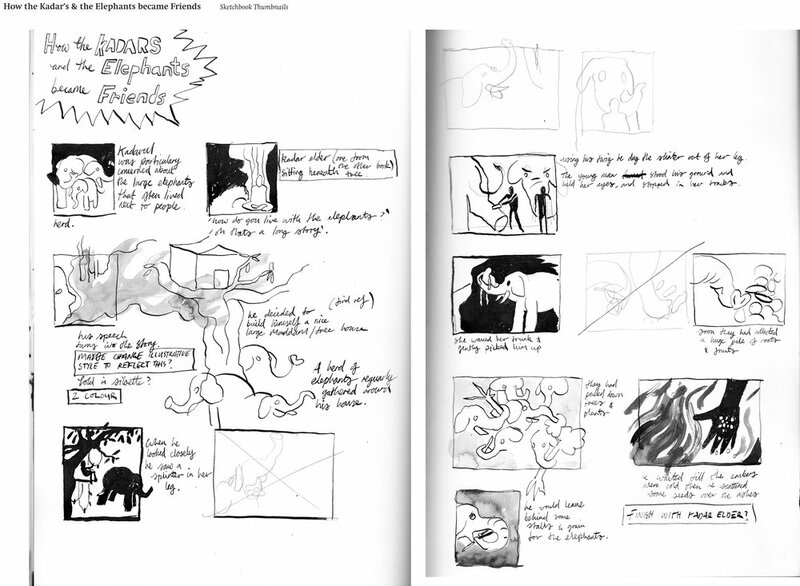 After reading through the book a number of times I selected what I considered to be the key visual beats for the story, annotating the text with questions and image requests. The Kadars are a reticent community with little documentation regarding them online, making the process of visualizing their world quite challenging from my studio in London. Fortunately the authors and the design team at Tara shared a wealth of reference photos, ensuring the flora and fauna of the forest was accurately represented. I subsequently embarked on the planning process for STAE. Upon my initial read through I was struck by how the stories resonated with my own childhood memories of reading Kipling, a number of the tales employing the same Lamarckian inheritance trope as The Just-So Stories. 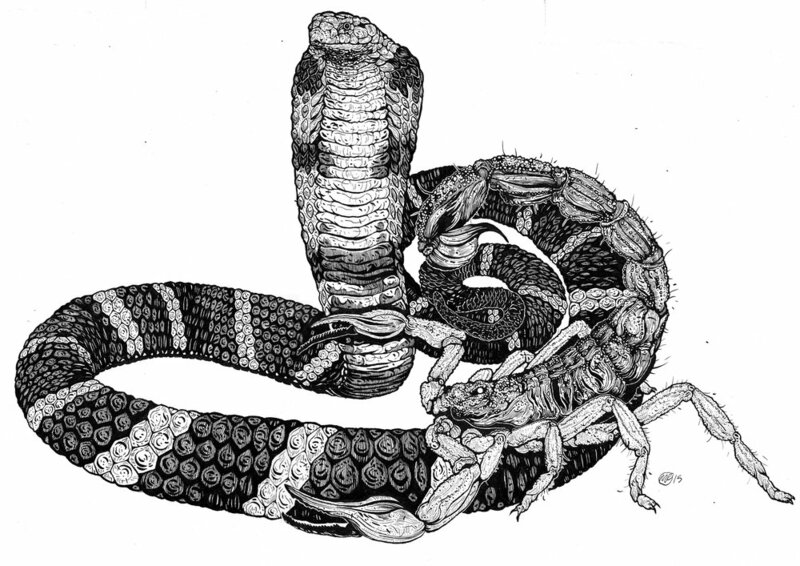 The notion that an animal can pass on characteristics it has acquired during its lifetime to its offspring appearing to be a theme spanning different cultures. With this in mind I visited The Kipling Museum in East Sussex, a beautiful country house staffed by incredibly enthusiastic volunteers. Drawing inspiration from his original ink illustrations I began working through the text, generating thumbnail sketches for each story before progressing onto drawing them as fold out vignettes. This allowed for the imagery to bleed from one page to the next, forming a connective tissue between each tale. The feedback on these maquettes was positive, but one of the issues I had was depicting a culturally sensitive vision of Kadavul. The Kadars having a strong oral tradition but little to no visual references to work from. Tara and I redefined my initial concepts, taking inspiration from Victorian picture books in the development of 5 frontispieces. 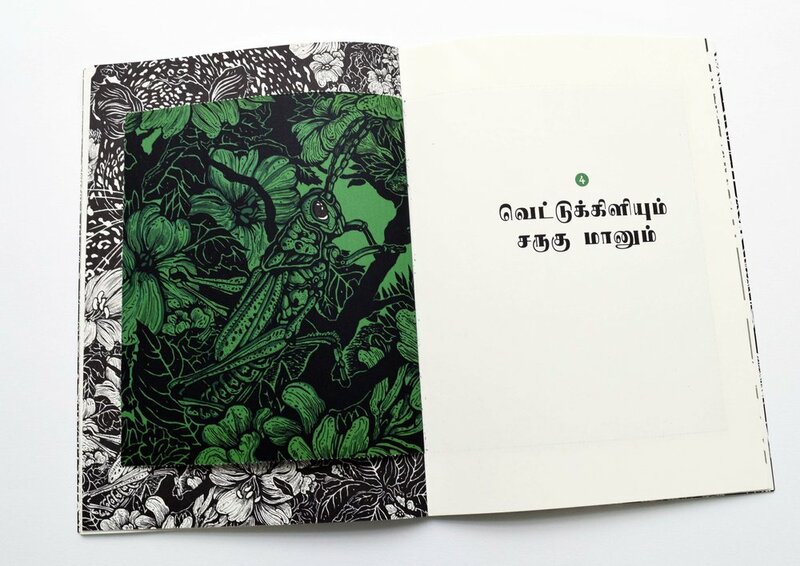 This placed the focus on animals and plants and allowed me to imagine Kadavul as an androgynous and abstract force of nature, visible only through glimpses in the foliage of the forest. 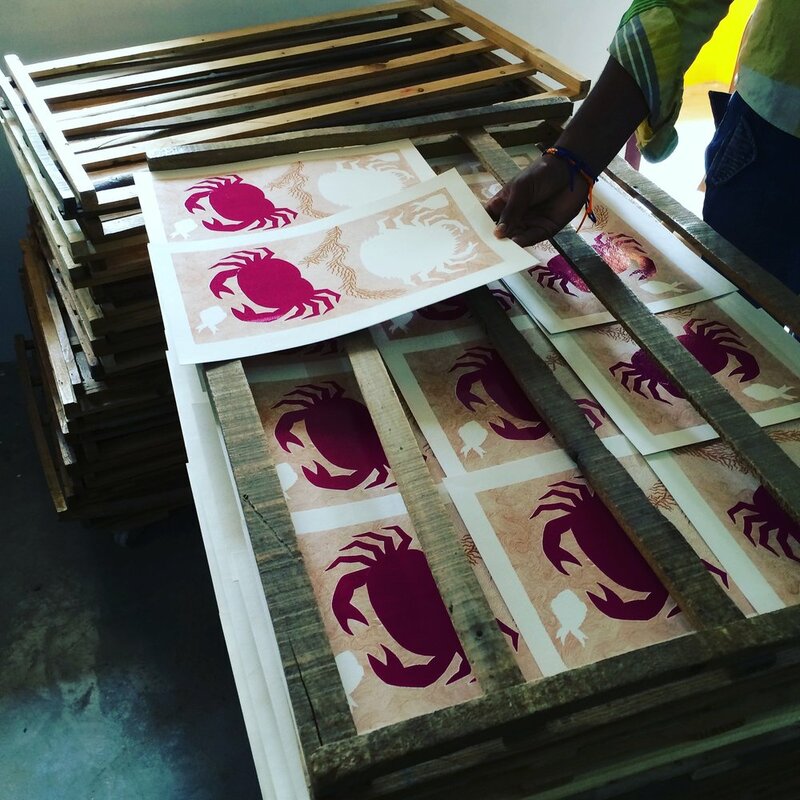 In September of 2015 I began a 6-month residency at Tara Books headquarters, The Book Building, in Chennai, India. Exciting as this was I spent the months leading up this adventure worrying that I would be ‘found out’, that I couldn’t draw, that I was totally talentless and that there had been some sort of terrible mistake in inviting me there. I’ve worked in pretty much the same way throughout entire career, in a little creative cocoon, surrounded by reference books and mugs of half drunk coffee. How would I cope without my light box? What about that specific paper that I always use?! I was doomed to failure and would be cast out onto the streets Chennai to wander aimlessly among the cows and auto-rickshaws. Fortunately this didn’t happen, I was fine. It was warm and welcoming and I learnt so much; my perpetual state of anxiety over my inability to draw properly (and just life in general) eased by my interactions with everyone at Tara. 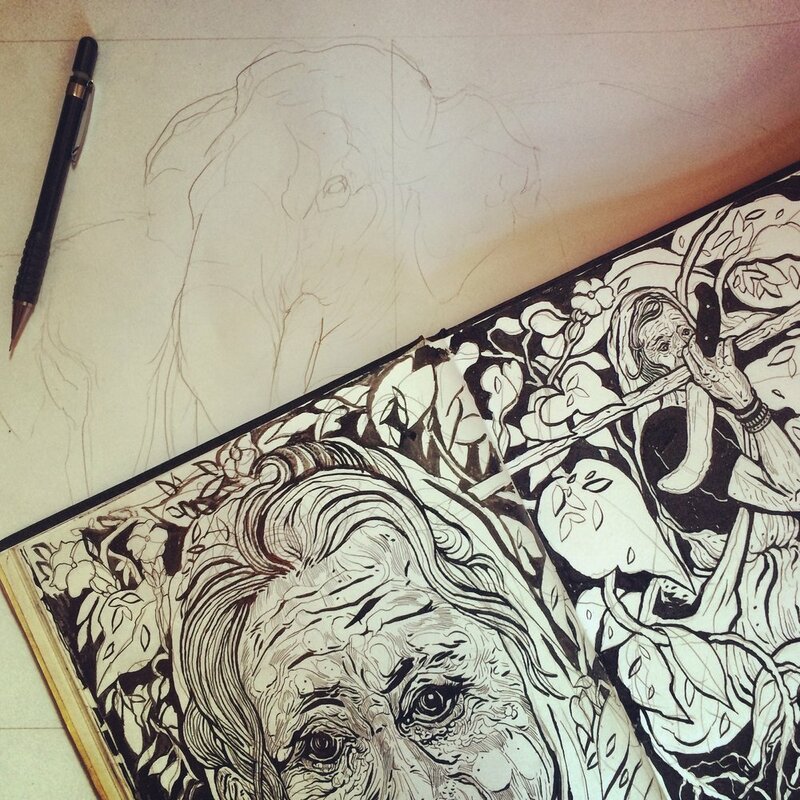 They encouraged me to take a less mannered approach with my illustrations, breaking each chapter down into one detailed pen & ink drawing juxtaposed against looser, sketchbook based images. This really was a first for me; I’m a slightly neurotic perfectionist when it comes to lines on paper, I always focus on the mistakes I’ve made or how an image could have been vastly improved if I’d taken a different approach. To have such a well-established publisher pull out what I considered to be extremely rough, practice sketches and turn them into the cover of a book was a little mind-blowing. I set up shop in my bedroom, a few feet away from the design studio and drew, got ink all over the floor, spent a vast amount of money on air conditioning and ate far too much bhel puri. I leant how to use a graphics tablet, encountered elephants wandering in the street and survived the worst monsoon Chennai had seen for 100 years. It was glorious, such a liberating experience and I miss that city and the friends I made during my time there. I also realized that my artwork isn’t about the things I have around me, I don’t need anything to be able to work effectively, I just need me. Preferably some sort of drawing implement too but apart from that I’m golden. I can work just about anywhere, and this attitude shift has really benefited me since returning to London. The mural projects I’ve done, the in-house illustration work I’ve completed for various companies. I think before I was really caught up in the idea of my ‘space’ and also what I ‘could’ and ‘couldn’t’ do. I can do anything, just give me a project and I can do it. My one bit of advice to anyone reading this would be to be constantly putting yourself in situations where you feel slightly out of your depth, it’s the only way you will progress and develop your practice. It can be scary, but scary is good, scary can make you feel alive and nothing will compare to the sense of achievement you get when you have completed what you thought to be an impossible task. I also had the opportunity to meet one of the authors and discuss her time spent with the tribe. 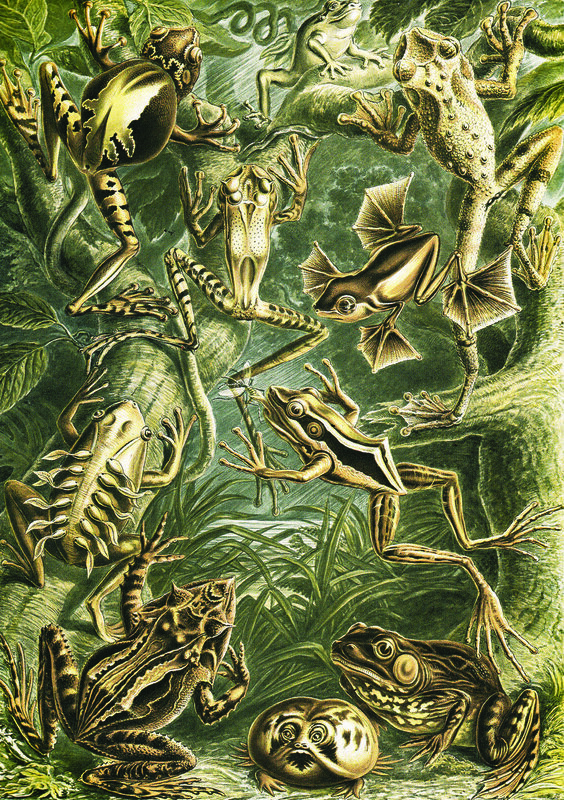 Madhuri Ramesh is a herpetologist obsessed with studying rare reptiles, and she, along with her co-author, the social anthropologist Manish Chandi, kindly gave me some of the back-story as to how these two books came about. “I got to the Western Ghats in 2000 and worked on and off in the Anamalais area for 3 years because I wanted to study this Travancore tortoise that's endemic to the region. My field assistant was from the Kadar community and since I was 20 something years old then, he treated me like one of his nieces: tell me stories, point out stuff, find things to snack on, lecture me and so on. It was a great experience because I'd grown up in a metropolitan city (Chennai). I also picked up their dialect and word got around that this crazy girl was not only searching for this difficult animal but could also chat in Kadar. So I heard a lot of opinions and stories from other Kadars too. The tortoise was my official agenda and all the cultural stuff was a lovely bonus. Whereas I think for Manish, the changing culture of the tribe was the focus when he went there a few years later, and the forest & wildlife stuff kept cropping up on the side? We both kept swapping these really interesting narratives and perspectives for years and finally, in 2010 we got down to writing it out. One the biggest motivations was that we felt these people had fantastic forest-based knowledge & culture and it deserved to be shared and appreciated by a much wider audience. So I wanted the text to talk about the relationship such people have with forests, especially the realistic aspects of both (not the usual glamorous ones presented in films and photos) - as you know, there's stuff on monkey poop and ticks for instance, and on how the Kadars are not some 'remote, untouched tribe' but multi-lingual folks with a long history of interaction with the outside world. I'd say the book is an invitation to readers - to keep an open mind and pay attention to how others see the world, instead of going in for all these terrible stereotypes and binaries. “I spent that year (2006/7-2008) among the Kadar of Valparai in the Anamalais, trying to understand change and profiling them and other communities of the Tiger reserve. During that revelatory year, what struck me most was their marginalization by many around them as 'poor tribals' - implying, being uneducated and people who lived in dark forests, of a lower rung in the caste hierarchy, as agents disturbing the natural habitat (and externalizing them as people of the forest who shouldn’t be living in the forest, for the benefit of wild animals). The community members, especially the older folk were very clear that they lived in 'their own' forests, and had a complete sense of ownership, while being told just the opposite by conservation and government (via the forest department), and were silently bearing with this huge transformation in their lives/generation. This struck many chords in me, and I realised they were using folktales (in my ethnographic pursuits) to describe and prove that they belonged to the region, as that is and was their orally transmitted history and only land they have traditionally owned. Their knowledge of the forests and its denizens only partly emerge in some of the folktales (as that is another facet altogether), also describing some relationships they have forged in the diversity of the forest, as humans of the forest among other animals. On the other hand as in a menagerie, they were critically aware of what space they occupied as components of the menagerie that many others made of their forests and of themselves, as objects, as tribals, and so on. I found the least amount of literature pertaining to these communities available, apart from few colonial records, and from one German anthropologist - Ehrenfels (who later developed and began the department of Anthropology, University of Madras). I was aware of the seeming lack of interest among many in the discipline due to a variety of reasons, and found that it was so unfortunate that we often look for the 'exotic' and 'unusual' to perk our sensibilities of people and nature around us. What I saw was a way of life (not necessarily unique) - as a form of identity (as is with most traditional societies) and of being caught in the middle of their way and the ways of others. I have partly brought this out in my report to the non-profit I worked for then. 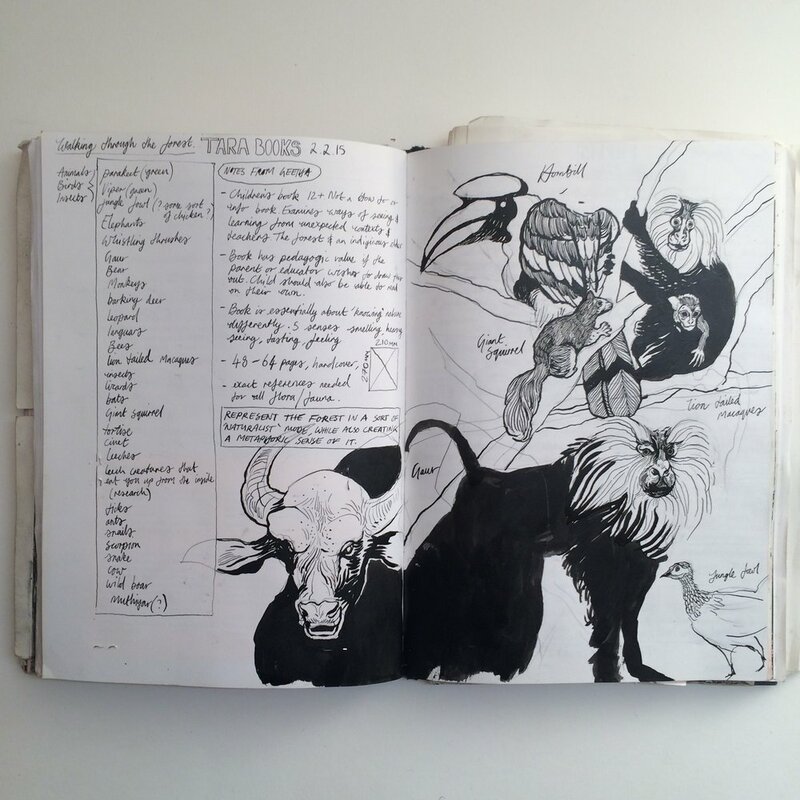 Their insights illuminated the text for me, and also provided a heightened sense of responsibility for bringing this world to life through my drawings. The Kadar’s are one of the oldest foraging and hunting groups in the world, but their numbers have dwindled, their language is replaced now with Tamil or Malayalam, and their ways of living are slowly being eroded. These books were an opportunity to document and educate others about the tribe; not as victims of development, but as worthy cultural and social peers with much to teach children from an urban environment about life in the forest. The A2 frontispieces for STAE were drawn using a dip pen and acrylic ink, each element of them being carefully researched to accurately represent the forest whilst simultaneously building a stylized habitat for the reader to explore. The original plan was to create a risographed edition of the book, but the level of black and fine detail involved in the frontispieces led to the images smudging during the binding process. Offset lithography was settled upon, with the design team at Tara creating a dynamic framing of the text and images through a series of moveable inserts in the final publication. I was fortunate enough to have the incredibly talented artist and designer Laura Nogueira take on a residency at Tara upon my departure. 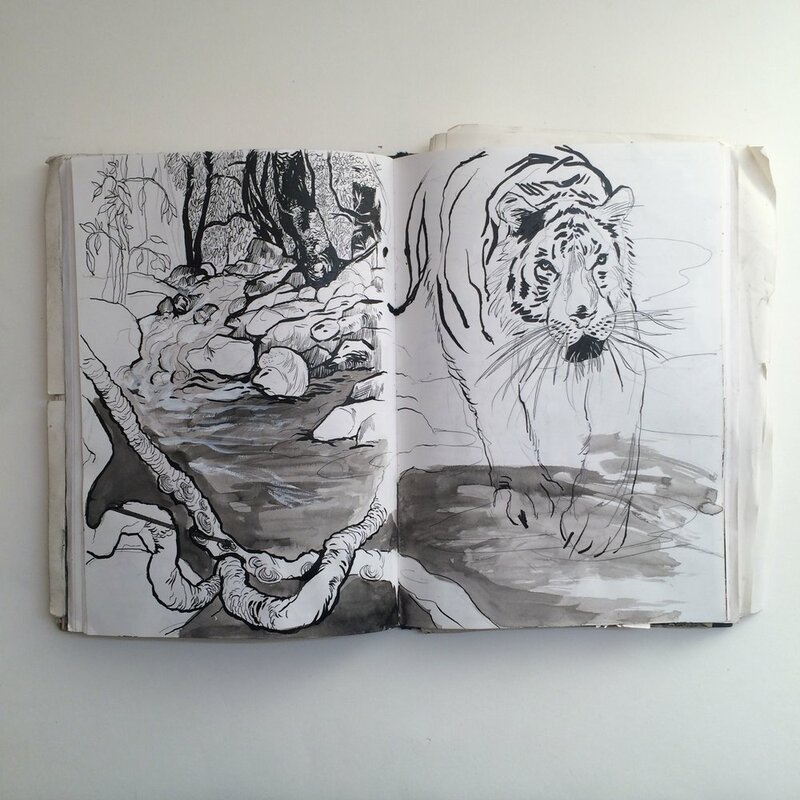 She was tasked with transforming my black and white jungle sketches for WIAWOK into the finished book and through multiple email exchanges and Skype chats we worked together in bringing the project to fruition. 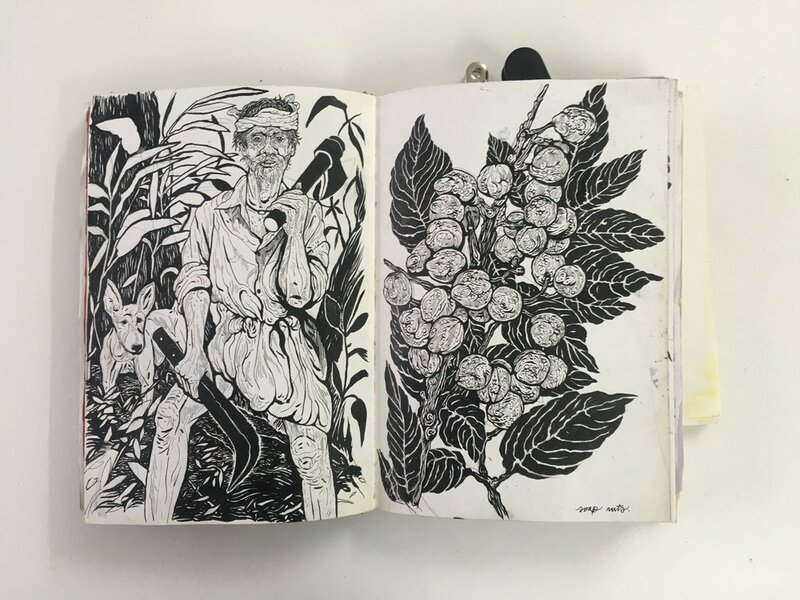 In the process of pulling the final design together I was asked to revisit my original sketchbook drawings and develop a series of new images and adjustments that would encourage the narrative flow throughout the book. The intertwining jungle paths described by the Kadar mirrored through the tangled leaves and branches of my illustrations. The books are available in both Tamil and English editions, a decision taken by Tara to repay the Kadars for their goodwill, generosity and knowledge by providing them with books some of them would be able to read. Despite my prolonged presence in Chennai I singularly failed, in a very British way, to pick up any Tamil (apart from saying hello - vaṇakkam) but I absolutely fell in love with the alphabet. Tamil is one of the longest surviving classical languages still spoken in the world, with manuscripts dating back over 2000 years. Seeing my drawings next to these beautiful swirls and lines, illegible to me as they may be, is fantastic. In addition to being available as books, images from both publications were developed into a series of oil based screen-prints; a section one frontispiece also formed the basis for an edition of abstract risograph prints. 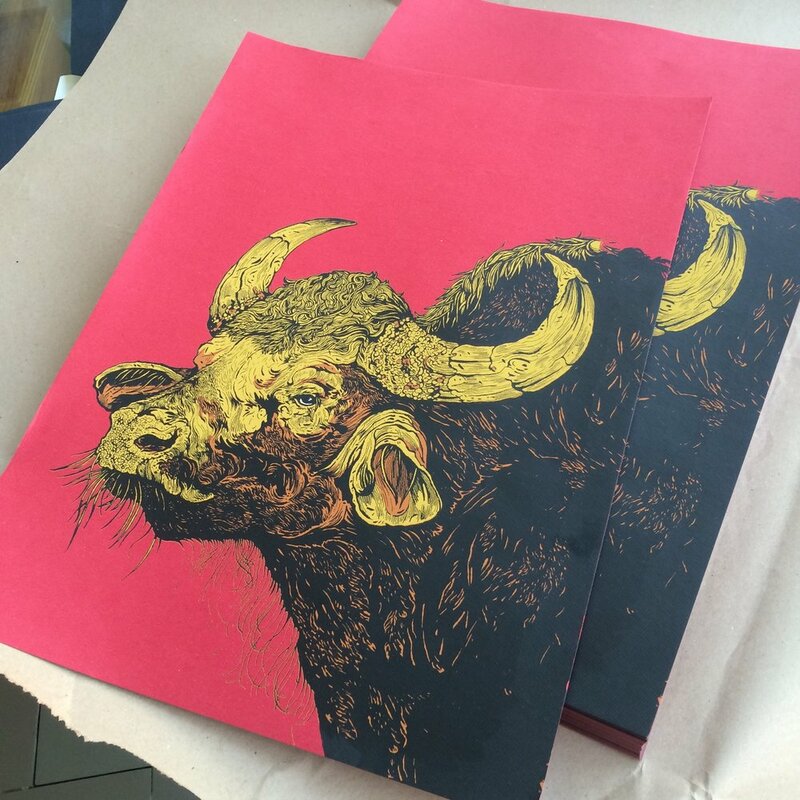 These prints and books are currently on display at an exhibition curated by Tara at The London Print Studio. If you would like to come say vaṇakkam in person please do join me there on the 1st February, 6.30 – 8.00pm, where I will be doing a brief presentation about my time in India and the process of bringing these two wonderful books to print. Thanks for reading. It’s been a desperately boring couple of weeks for me; I managed to trap a nerve in my shoulder that has lead to me being in almost constant pain. I’ve never experienced anything like it, the worst aspect of it being this nerve connects straight to the thumb and forefinger of my right hand, rendering them totally numb. It’s been impossible to draw, to write, cook, even typing on a phone or scrolling through Instagram has been difficult. The numbness and pain have subsided now (I wouldn’t be able to write this otherwise) but it’s still not quite right, I just really want to get back to my studio. I’m seeing a physiotherapist later this week so fingers crossed he will snap me back to normalcy, I can’t take another week of this! Although I must say, despite the pain and aggravation, there is nothing quite like having an enforced hiatus from pretty much everything to make you reassess your life. When you are so totally defined by what you do as a career but then are physically unable to pick up a pencil it’s terrifying. I was convinced I would never be able to draw again, or not in the same way I used too. Despite multiple reassurances from trained professionals that this was not permanent damage my anxiety-riddled brain would do it’s best to convince me on a daily basis that this was it. No more art, no more printmaking, nothing, just floating in a cloud of codeine, auto playing my way through Netflix’s entire back catalogue with my arm in a sling. The irony is this comes on the heels of a recent portfolio review I had at the Association of Illustrators. An extremely productive meeting that led to me formulating big plans of where I was going to focus my illustrative energies in the future. These plans still exist; I will share them soon and begin to turn the advice I received into a sort of ongoing digital project that I’ll document on this blog. Right now I’m just focusing my energies on getting better, the relief I felt when my fingertips started to respond in a recognizable way was intense and I have no desire to ever damage myself like this again. So lots of tea drinking and arm resting for the time being, I’m really excited about finishing off my latest piece of artwork but unfortunately it’s going to have to take a back seat for a while. Bloody arms, with their nerves and things, why is the human body such a cavalcade of horror? I just want a nice, robotic arm, that would be ideal. I’d never have to worry about this nonsense ever again, I’m going to write to Elon Musk and see if he can sort me out with something. Back from holiday and a slightly abortive attempt at completing Inktober. I gave it a good go but my God life just gets in the way sometimes, next year I’m going to nail it i’m sure. Focusing on the positives though I thought I would share some amazing prints! I had a really productive and interesting meeting last week with John Phillips & Pippa Smith of The London Print Studios, a beautiful workshop and exhibition space based on the Harrow Road. Tara Books are going to be holding an exhibition there from November 14th and have asked me to prepare a brief presentation for the private view based on my experiences working with them in India. It’s also serving as a kind of soft launch for the Speaking With an Elephant, it’s unique design forming a focal point for the show. LPS was founded in 1974 as the Paddington Printshop and based in a squat just round the corner from it’s current location. I was fortunate enough to have John show me a small selection of the wealth of posters he had created from the 70’s till now, really beautiful oil-based silkscreens that serve as timeline of sorts for countercultural protests and political activism in London. This to me is what is so great about the printmaking process, the ability to generate immediate, visceral reactions to your social and political environment. John is currently in discussion with 4 Corners Books with the intent of bringing out a publication featuring his collection, I really hope this goes ahead as I think what has been produced in this corner of West London needs more exposure and recognition as a very British version of the Atelier Populaire (of which 4 corners also published an amazing book on). Oh and also Joe Strummer’s band before The Clash, The 101’s were the house band in the original squat, which is amazing. More amazing than that I got to hold a print the man himself had made to promote one of their gigs! So cool. 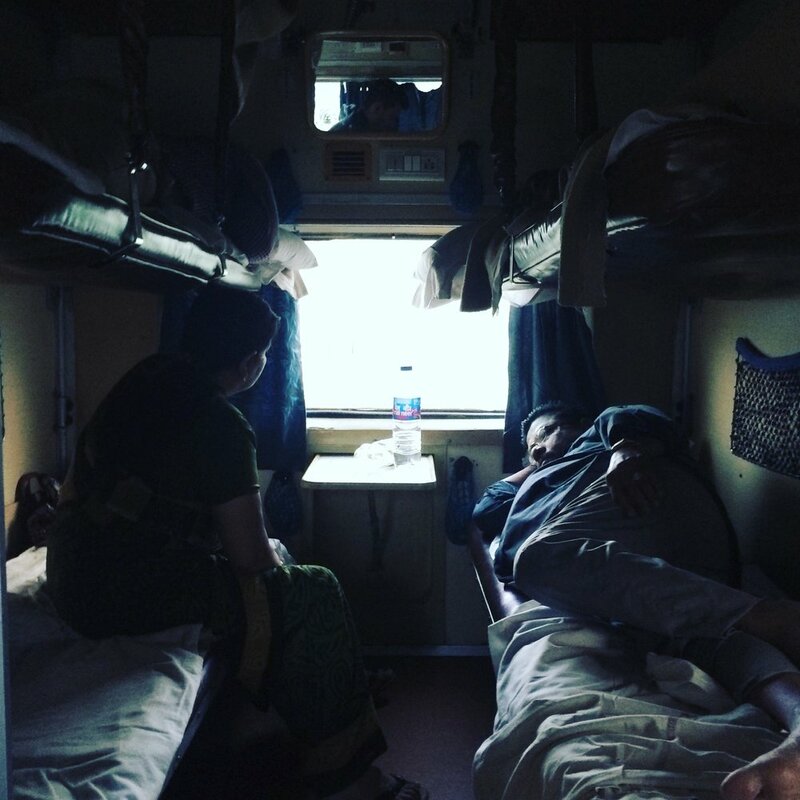 On the 15th of September, 2015, I flew out to Chennai in Tamil Nadu, India, to begin a 6 month residency with Tara Books. During this time I worked on two separate publications that explored the lives and folk stories of a small indigenous Indian tribe called the Kadar. Walking is a Way of Knowing relates the Kadar's ways of living within the forest, and also explores ideas about learning from unexpected resources, namely the Kadar elders who are the protagonists in this book. 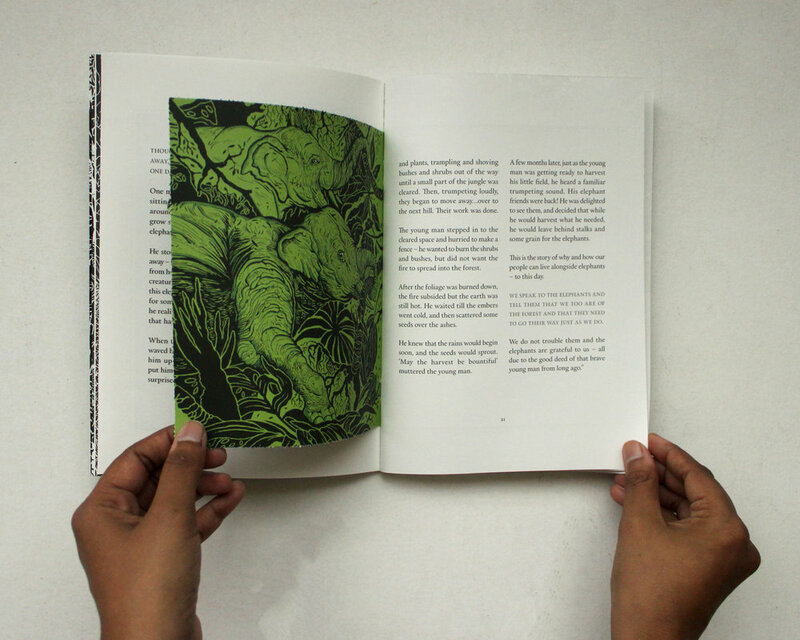 Through their stories the reader is intended to reflect on nature, to begin to know it differently - not just through sight but taste, smell and hearing as well. The book has now finally gone to print in both Tamil and English language editions, due to be released on October 15th. Tara's British publicists have kindly decided to make it one of their featured publications for this month. I will be available through till Christmas for book signings, presentations and general chit chat - if you follow this link it will take you to the relevant sign up page, so looking forward to talking about this project with people! Do you like Spiderman? I like Spiderman. If you want to hear me talking about Spiderman here is a little promo I did for Moo.com earlier in the year. “It is at work everywhere, functioning smoothly at times, at other times in fits and starts. It breathes, it heats, it eats. It shits and fucks. What a mistake to have ever said the id. Everywhere it is machines — real ones, not figurative ones: machines driving other machines, machines being driven by other machines, with all the necessary couplings and connections”. This piece is a response to the pervasive narrative within society that millennial’s are entitled, spoilt, vain and lazy. If only we’d stop spending our money on avocados and iphones we would be able to afford to live in London, get on the housing ladder and achieve the social ideals as set out by the post-WWII generation. Ironically we are living in their vision of the future, one where the structures in place that allowed them to thrive and prosper have been slowly dismantled; social mobility, education, healthcare and workers rights are all under attack or fading memories with the financialization of every aspect of human existence keeping people in a state of perpetual anxiety. Britain is currently facing a national crisis in terms of mental health, particularly in young people. Depression is now the most commonly treated illness by the NHS, with record numbers of university students requesting counselling services or dropping out of their courses due to stress. Deleuze and Guatarri’s seminal critique of capitalism, Anti-Oedipus, posited that certain conditions, such as schizophrenia, were not natural but a specific product of a political environment. The enormous psychic pressure to succeed in an increasingly unstable world is clearly having a detrimental effect on young people, the added stress of having their lives constantly under a microscope through various social media platforms compounding the situation. There is a dichotomy inherit in smartphones, being both a tool for work and for pleasure, making them beguiling and dangerous objects. You ‘have’ to have one, be constantly connected to the world and forever striving to present your perfect digital self for consumption. It’s not about vanity; to be a functioning part of the machinery of late-stage capitalism you yourself must become a product. In my subversion of the lifestyle imagery of the 1950’s & 60’s my intention is to reframe the growing problem of anxiety, shifting the focus away from the individual and to society as a whole. Since the catastrophic failure of neo-liberalism in 2008 we have been living with its corpse, unable to envisage a future outside of the current capitalist narrative. Time seems detached from reality as nothing changes, and nothing moves forward. The atemporal nature of our environment, the chaos that surrounds us, the increasing atomisation of society, and the alarming rise in depression and anxiety are all products of a failed economic system. Instead of castigating millennial’s for a seeming fecklessness it may do to consider the ideologies propagated in the world we inhabit and how they are contributing factors to the selfiefication of culture. By rejecting the machine and reclaiming sociality we can overcome perceived difference and apathy thereby initiating positive change for the future collectively, across multiple generations. And that is the future that I would give up avocados for, nothing less will do.